both for solvent-based or water-based painted products. box furnaces and furnaces with mesh conveyor. Furnaces designed to comply with the regulations of the leading surface anti-corrosion treatments paint manufacturers for solutions in solvent-based or water-based. 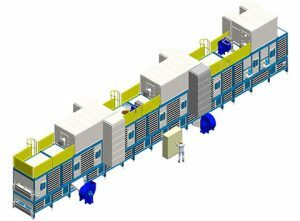 Furnaces with three independent zones for evaporation, curing and cooling, with independent management of the volume of air to be renewed, recirculation and temperature setpoints. Designed to prevent the escape of air from the curing area into the evaporation area or into the factory. System for the homogeneous product distribution on the conveyor or box surfaces. Greater effectiveness in the temperature rise curve between evaporation and curing. High stability of the evaporation and curing temperature curve with regards to the setpoint temperature. Compliance with the surface thermal insulation of the furnace (250mm of 100Kg/m2 mineral wool). 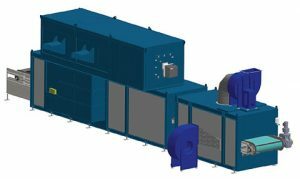 Optimised cooling (with the possibility of adding external cooling) at the output of the pieces at a homogeneous temperature, to reprocess the parts. 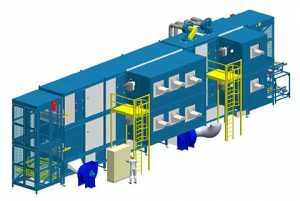 Furnaces designed to reduce marine and land transport costs. Furnace modules can be transported in standard “High Cube” containers and standard road transportation.